We talked to Sam Myers about his custom built bored and stroked TRX250R 2-Stroke monster. Get the full story and photos here! Honda's ATC250R had to be discontinued due to safety, but they still have a following today. There are leaders, and then there are followers. The ATV industry is not exempt from that core business principal. Over three decades ago, Honda was stuck in a rut after the ill-devised ATC250R three-wheeler resulted in a diabolical nightmare for Honda’s insurance claims department. The Japanese manufacturer needed a sure-fire winner. They found the answer in the 1984 TRX200 four wheeler, which surpassed Honda’s sales forecasting. Fortunately, Honda didn’t rest on their laurels. The brand addressed grumblings from ATV enthusiasts looking for something more than a workhorse machine built for farms. Casting aside the contemporary utilitarian directive, the Honda TRX250R was borne out of necessity. Many ATV riders were clamoring for a sleek, nimble handling quad with the extravagances of modern technology. They got more than they could have ever wished for in what was simply dubbed the “250R.” Honda unveiled the quad in 1986. Replete with a space-age liquid-cooled two-stroke engine, close-ratio six-speed transmission and agile frame, The 250R was capable of standing up to the rigors of jump-laden tracks and power-robbing silt beds. Honda ceased production of the TRX250R following the 1989 model year, but the popular two-stroke still remains relevant in many ATV circles to this day. Unfortunately, as years pass it becomes infinitely more difficult to find an operable, clean 250R. However, if your name is Sam Myers, you don’t give up the search. 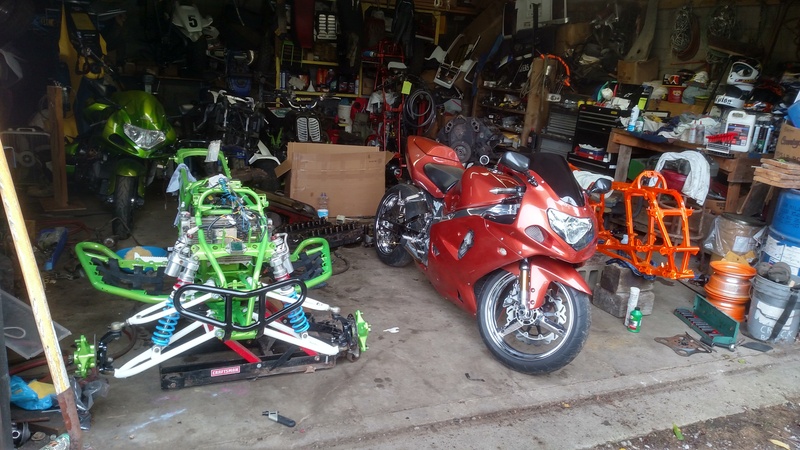 The exotic bike connoisseur has a collection of one-of-a-kind machines that would floor any hop-up junkie. His 1988 Honda TRX250R might be the crown jewel. Punched out to 373cc, this isn’t your grandfather’s engine. The blend of OEM/aftermarket components add to the allure of a four-wheeler that, nearly 30 years later, still hasn’t gone out of style. Sam Myers' not-so-stock 1988 Honda TRX250R. We had to learn more about Sam Myers’s 1988 Honda TRX250R, so we tracked him down in Pennsylvania. Sam is a classic example of a horsepower nut who appreciates the nuances and simplicity of two-stroke engine design. 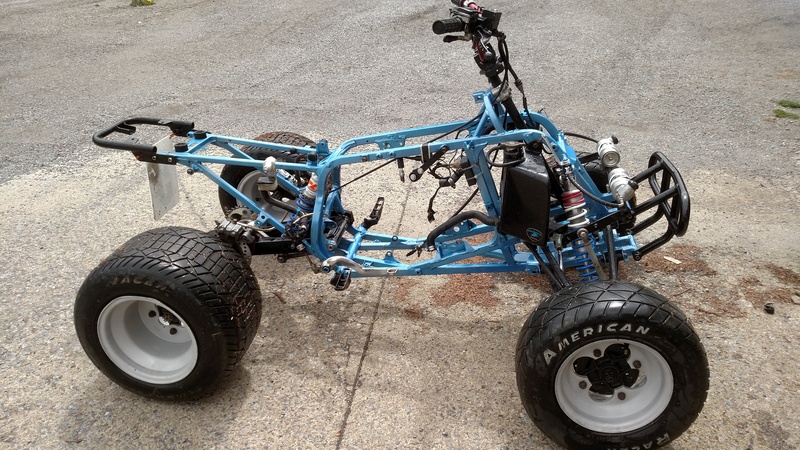 Read on to find out what Myers did to make his version of what many consider the ultimate ATV. Wiseco: How, exactly, did you acquire a 1988 Honda TRX250R? Sam Myers: I acquired the TRX250R approximately six years ago. A local guy owned it and he had blown it up and lost interest in the idea of fixing the engine. Since I’ve owned it I’ve gone through two full rebuilds, making changes from the frame color on up. I traded the previous owner a well running 2003 Yamaha Banshee I had at the time for it. The 1988-’89 era 250R four-wheelers are getting hard to find complete and in decent shape. I didn't care that the engine was blown up, because it was all there and complete. The 1988 TRX250R shortly after Myers acquired it. Wiseco: Why did you decide on the 1988 TRX250R, as opposed to any other year? Myers: I decided on the 1988 because the 1988-’89 years are the best years of the TRX250R in my opinion. After I acquired the TRX it sat around for a year or more untouched. The reason being that I was working on a few other projects. Having said that, I never lost interest in fixing it up someday. 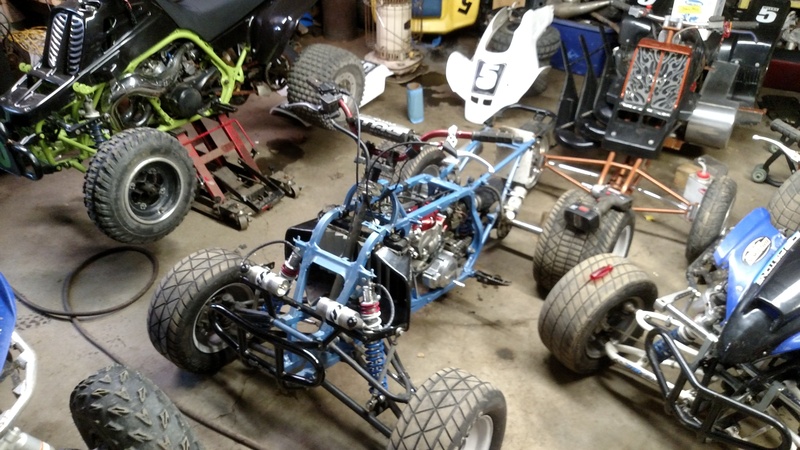 When time finally cleared, I began stripping the TRX down for a full rebuild. 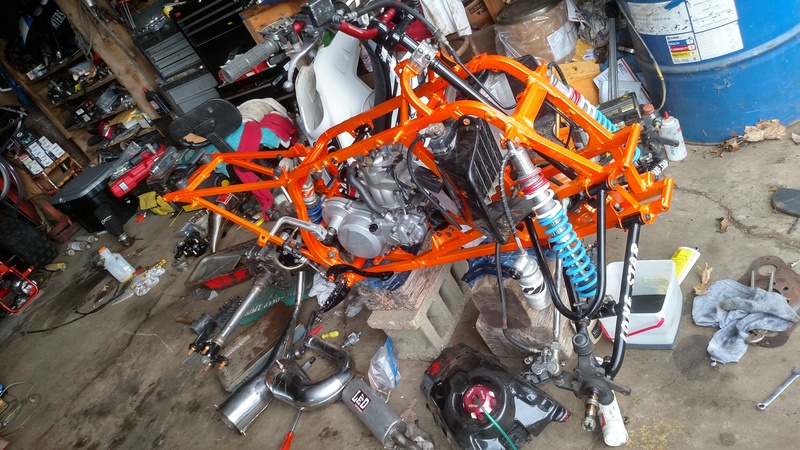 The TRX250R in it's tear down phases. With the motor out, there is still more stripping down to be done. Sam will ultimately have it down to bare frame. Wiseco: What was your vision before starting the rebuild? 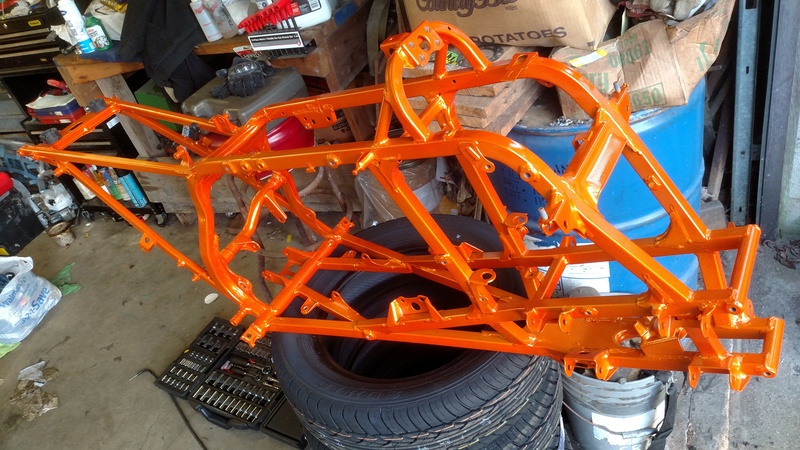 Myers: I really had one primary goal that I wanted to achieve, which was to rebuild the TRX using the stock frame. That’s mainly because I have the original title for the quad in my name. 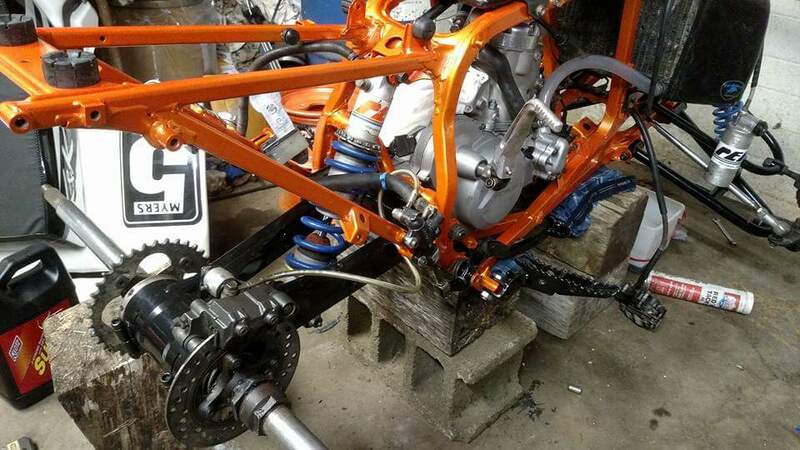 I simply didn’t want to swap frames, even though an aftermarket frame was an appealing idea. There are less of these 250R’s out there with titles than people think. 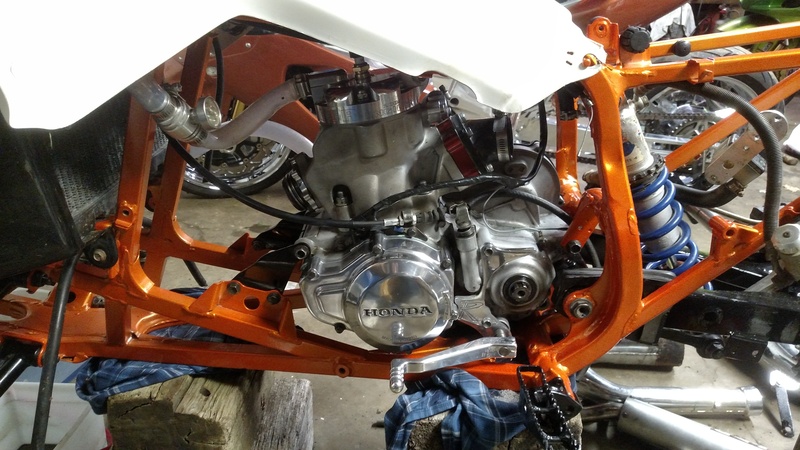 As for the direction I wanted to take with the rebuild, I was heavily involved with oval flat track racing when I started the tear-down process. That interest led me to gear the TRX250R toward flat track racing. 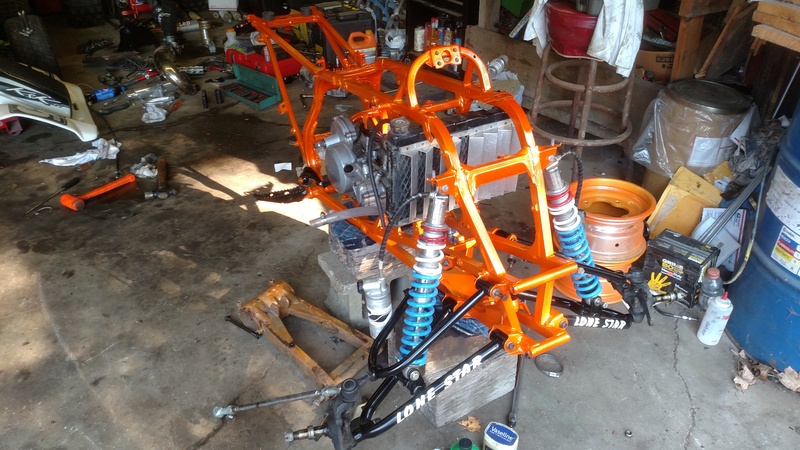 Myers' main goal was to complete the build using the original frame, especially he was able to find this TRX with a pink slip. Wiseco: Due to the model’s popularity, there are still a lot of hop-up companies selling parts for the TRX250R. 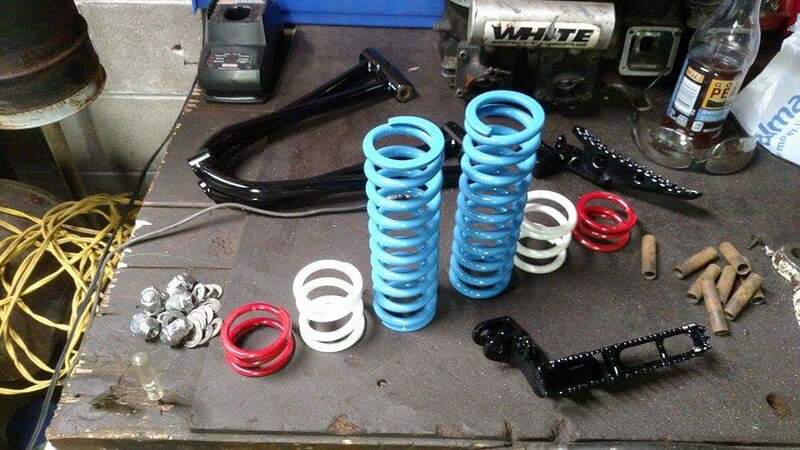 What aftermarket components did you invest in, and why? 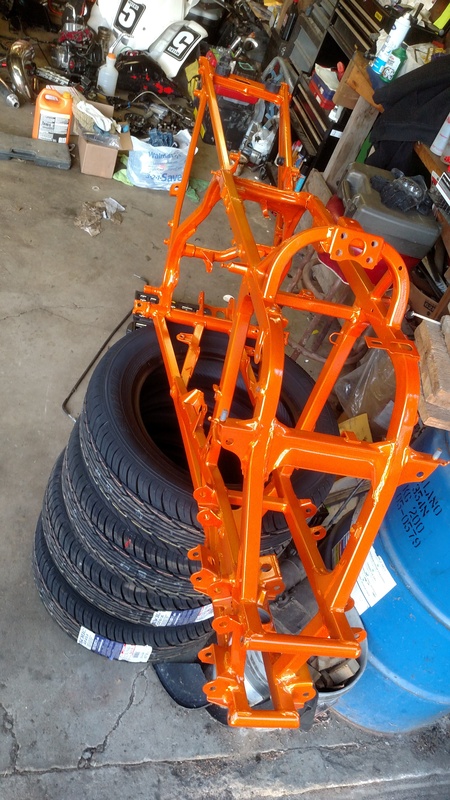 Myers: I have a large variety of parts used on this quad. The A-Arms are Lonestar Sport Style +2+1 arms. 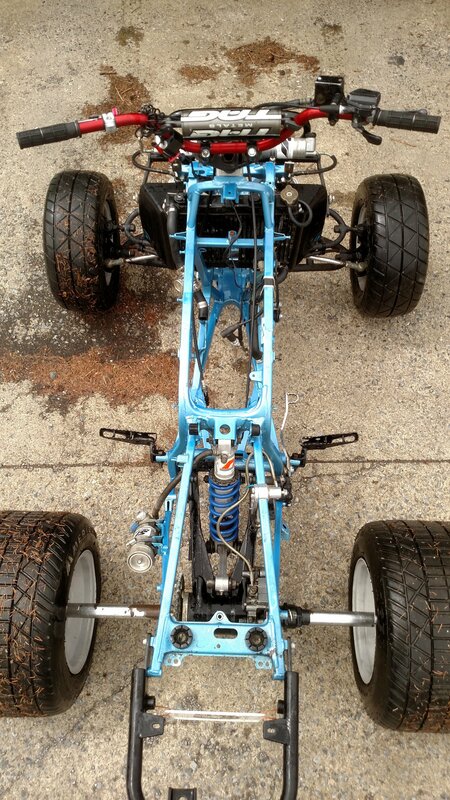 The rear swingarm is a -3 Laeger’s Racing arm. For flat track I shortened the swingarm for better hookup. The suspension is now all Performance Engineered Products (PEP)–front and rear. The front shocks are ZPS units, with the adjustable ride height rings and a variable sensing damping system. I installed a Duncan Pro Elite steel front bumper. There’s also a set of Fullbore plastics with old school Nac’s Racing number plates and radiator shrouds. 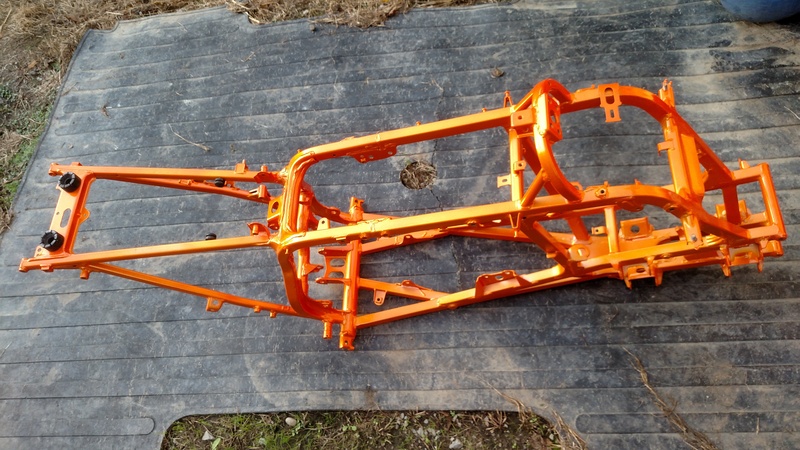 The frame was coated with “Illusion Orange" powder coat. Truth be told, the Duncan bumper, Nac’s Racing number plates and Fullbore radiator shrouds are getting very hard to find these days, as they are not made any longer. 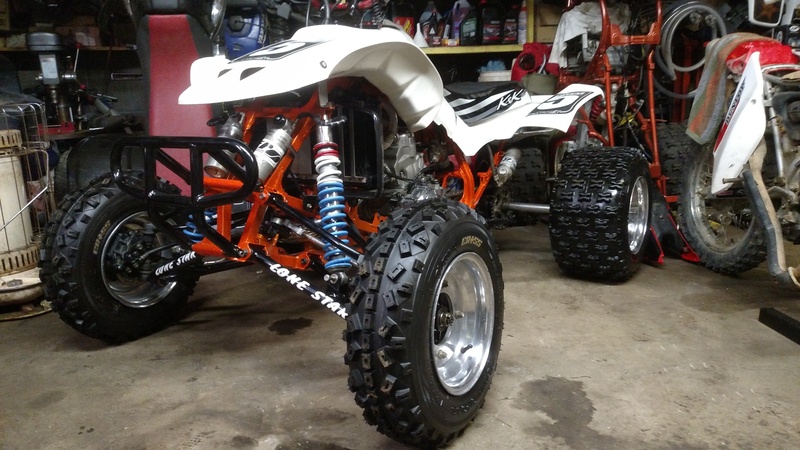 The TRX250R features Lonestar A-Arms, Laeger's swingarm, ZPS shocks, and Fullbore plastics, among many other parts. Wiseco: What kind of fuel and ratio do you run? Myers: I run Klotz Super Techniplate pre-mix in all my machines at a 32:1 ratio. The exception would be my triple cylinder dragster quad, which I run at 40:1. The compression is around 14:1 on this build, so the use of high octane fuel is needed to avoid pre-detonation. Wiseco: What exhaust system did you use? Myers: Hands down one of the best pipes out there is from LRD. Arlan makes pipes for every application. This specific pipe is a LRD 350D Big Bore exhaust. 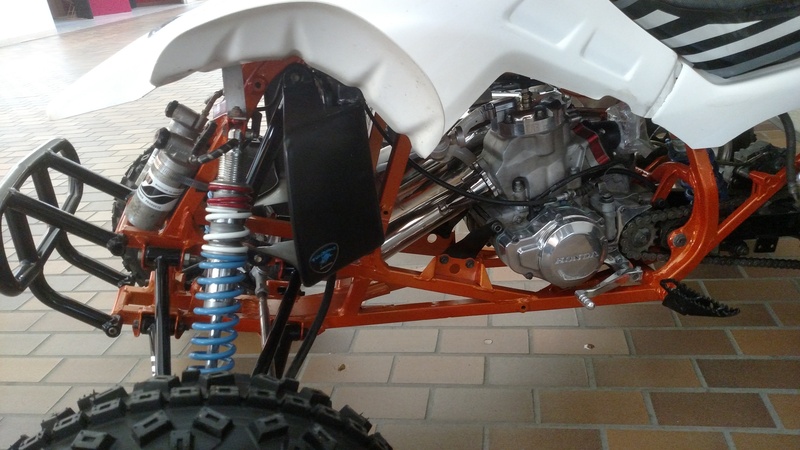 The motor is currently 373cc, which is quite the increase from the original 249cc. I have utilized many Eddie Sanders Racing (ESR) parts on this build. 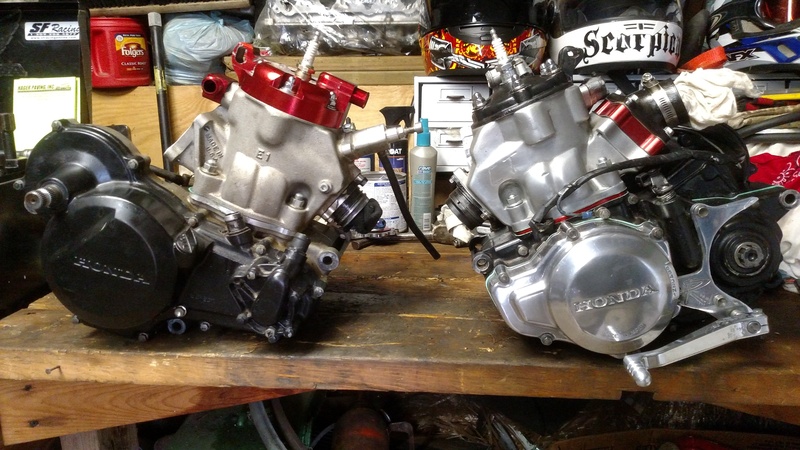 My TRX250R contains a 78.5mm big bore ESR cylinder and head. Eddie makes great products; however, his domes are never very consistent. As a result, I had the dome cut by Bubba Ramsey at BHP Racing. Wiseco: What other engine modifications were made? Myers: The engine relies on a 78.5mm Wiseco forged piston. 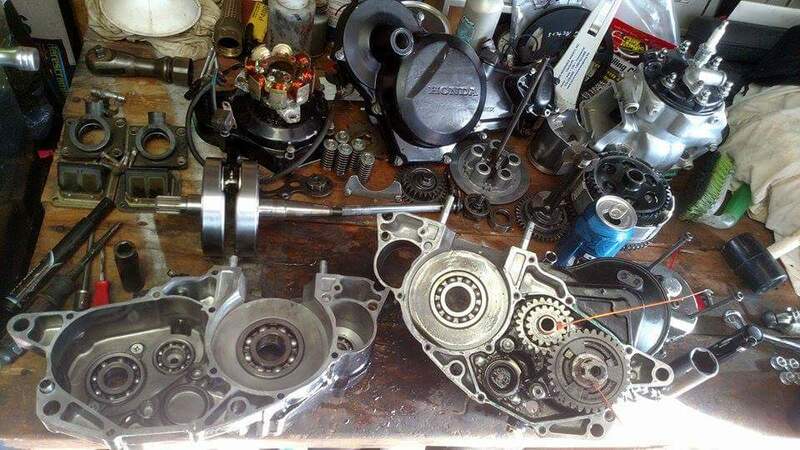 The crank was sent out to Eddie, and he did a +5mm stroker on it. A Wiseco connecting rod kit was used in the reassembly process. The main crankcases were also sent to Eddie to be bored out. 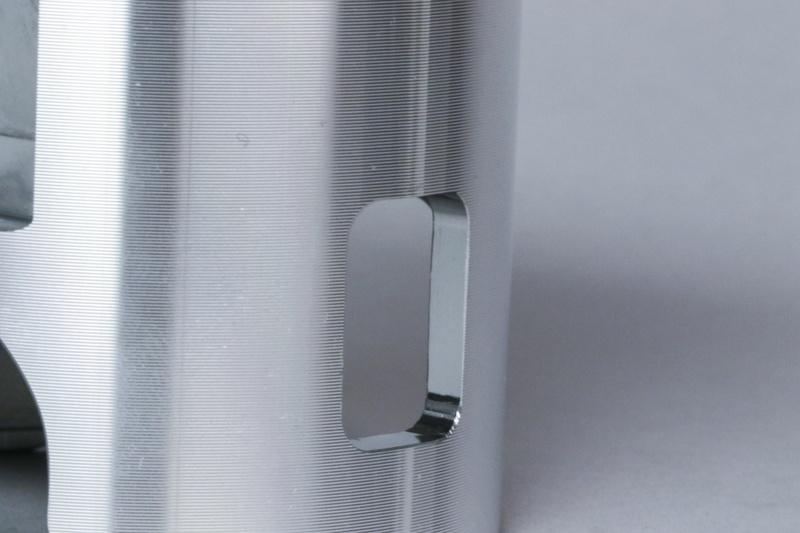 The case boring is required to accept the larger sleeve size for the big-bore cylinder to fit onto the cases. 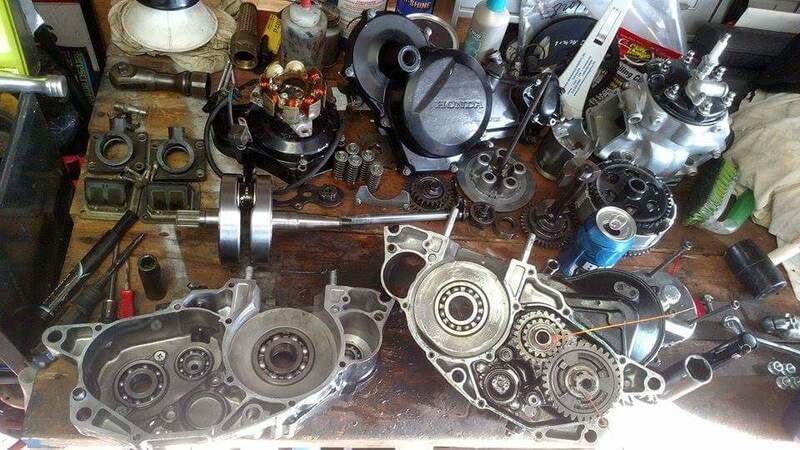 All of the transmission and counterbalancer bearings were replaced. That was a precautionary measure. It made sense, given the age of the TRX250R. I went with a full Hinson Racing clutch setup, including the clutch basket. For even more performance, I opted for a billet ESR reed block with carbon fiber reed petals, along with UPP oversize intake boot and Keihin 41.5mm carburetor. The air cleaner is an ESR pod filter setup. 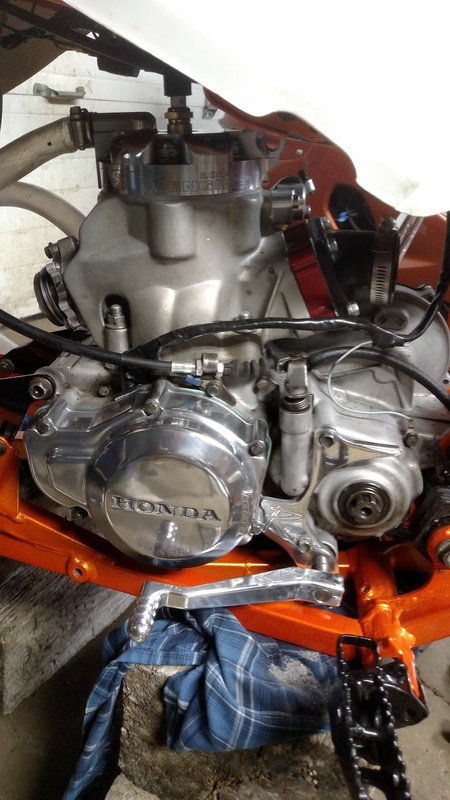 After all the modifications were done, the original cubic displacement of the engine jumped from 246cc up to a monster 373cc big-bore stroker. 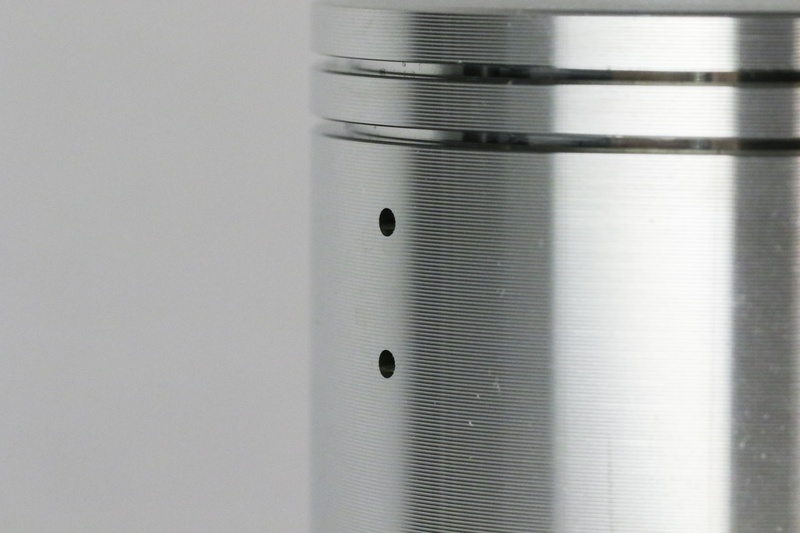 The Wiseco 78.5mm piston powering Myers' TRX. Myers also chose Wiseco for a crankshaft bearing and seal kit. 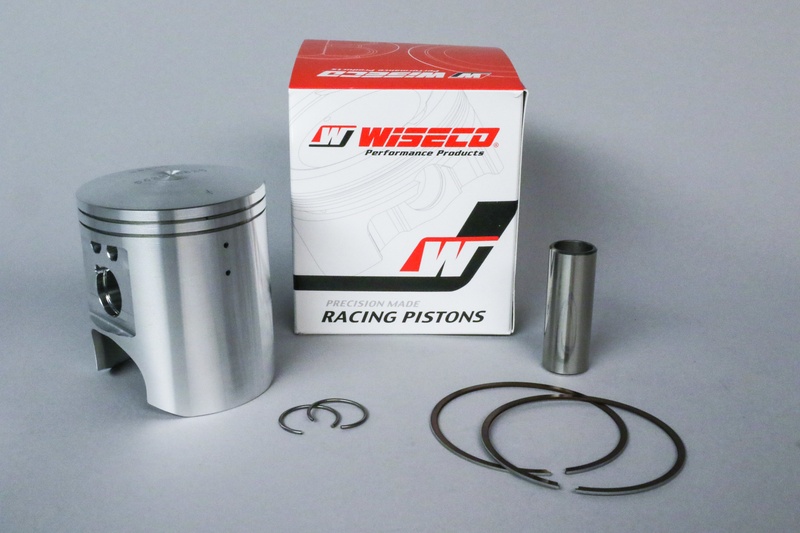 View Wiseco piston options here. Wiseco: Are you surprised that Honda’s nearly 30 year old two-stroke technology can still keep pace with modern four-stroke advancements? 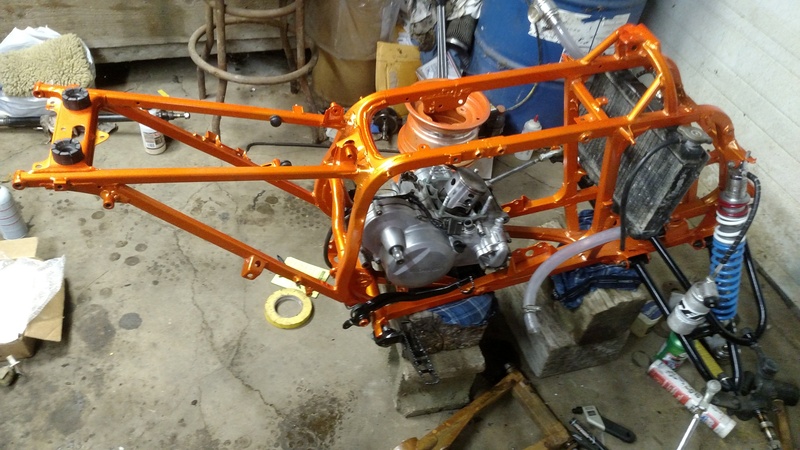 Knowing the power of freshly built 250cc 2-stroke, we can only imagine what this 373cc feels like. Myers: No, I am not really surprised that the old two-stroke Honda will run with the new-age four-strokes. The 250R is a legend in the ATV world, to say the least. 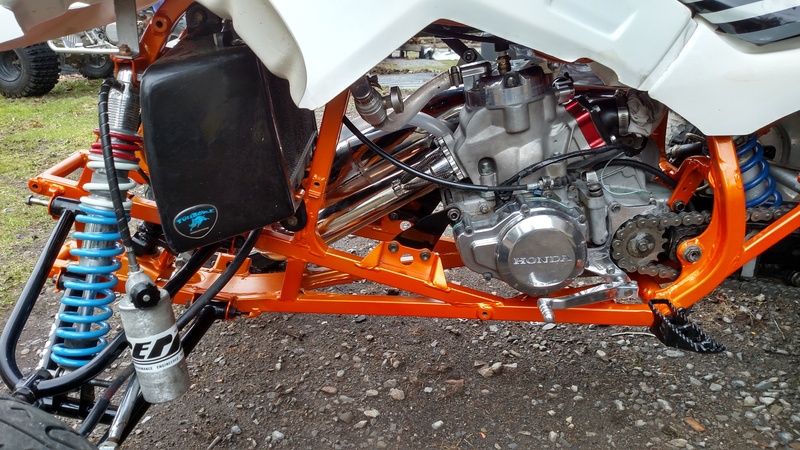 This particular one, given all of the heavy modifications, will walk all over most new four-strokes. 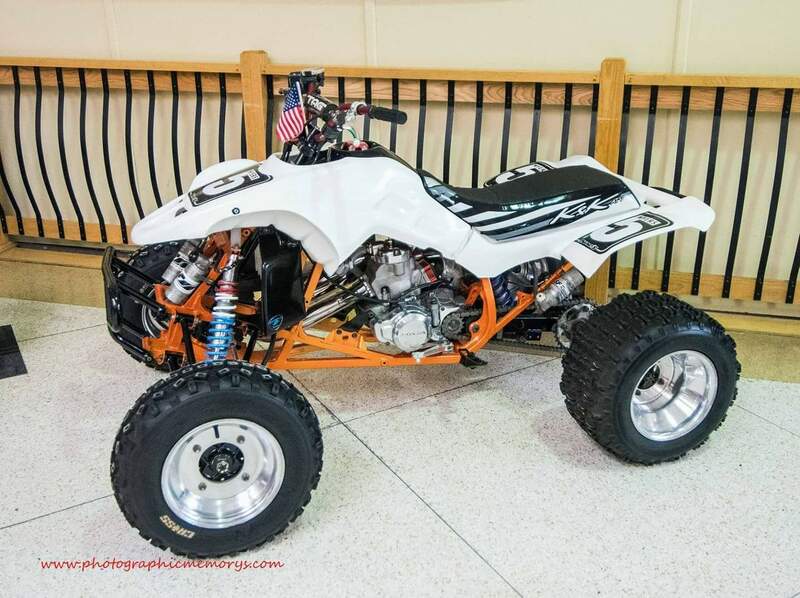 Wiseco: Do two-strokes still have a place in ATV circles? Myers: I fully believe two-strokes still have a place in the ATV world for many reasons. 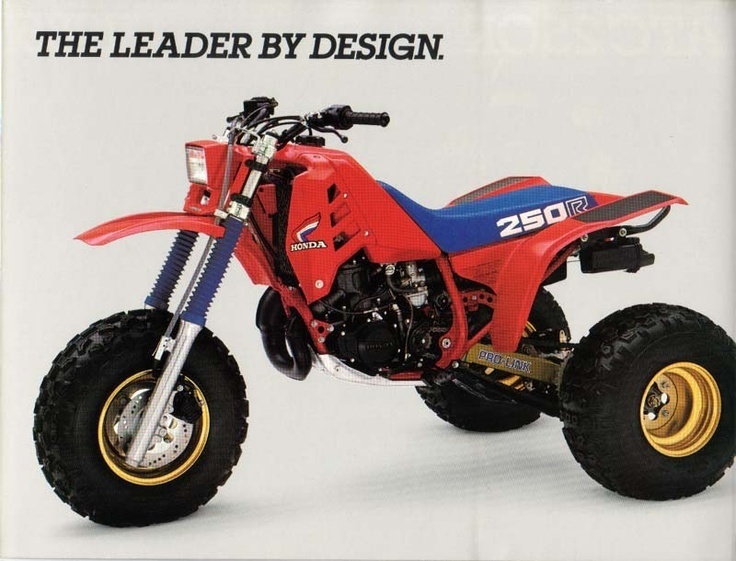 A lot of the newer quad designs were based on the technology of the 250R. I am a die-hard two-stoke guy. I currently own 10 quads, eight of which are two-strokes. 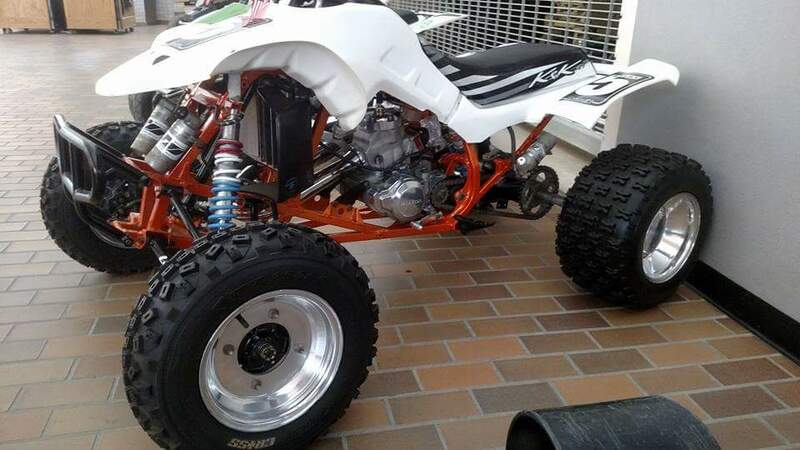 They range from Quadzillas, Banshees, 250 Quadracers (Suzuki LT250R) and more. I own two new-age 450 four-stroke quads and they rarely get ridden. In my opinion nothing rides like a two-stroke. The sensation of the engine climbing through the midrange and reaching the arm-ripping top-end will make you feel alive. I also need to mention that it requires a small fortune to maintain modern four-stroke quads. A head job alone can cost upwards of $500, and that’s not including labor. Two-strokes should be an active part in the racing community. Not everyone–especially kids–can afford to run and keep up on the maintenance needed for a four-stroke. Plus, some riders prefer two-strokes. I’m one of those people. Scroll down for a full photo gallery! Photos courtesy of Sam Myers. Find Sam Myers on Facebook.